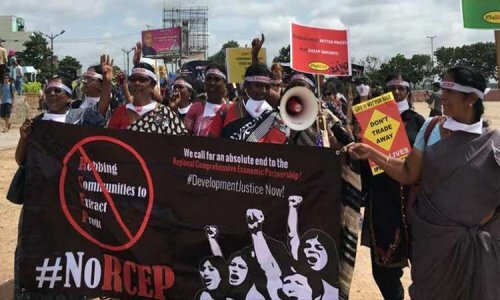 Singapore : Trade officials from 16 countries that are negotiating the Regional Comprehensive Economic Partnership (RCEP) are meeting in Singapore this week to advance this ambitious mega-Free Trade Agreement (FTA), however civil society has been shut out. "The Governments and TNCs gathered in Singapore are deciding the rules for tomorrow’s digitised economy. It defies logic that workers, whose fundamental rights will be directly affected by these new rules, have been completely shut out of this process. Meaningful engagement with workers and other affected communities from across the region is a necessary precursor for workers to exercise their democratic rights ; what we have seen here makes a mockery of these rights." said Building and Wood Workers International (BWI) Regional Representative Apolinar Tolentino. BWI represents close to 4 million workers in the Asia-Pacific region, with affiliate unions in thirteen of the sixteen RCEP countries.